IMPORTANT MESSAGE TO ALL READERS FROM THE USA & CANADA: Follow this LINK to download your free Bonus CD & PDF. Fireworks #69 stands tall as one of the very best issues we've ever put out. First up we have a phenomenal interview with David Coverdale who talks all about the new Whitesnake record 'The Purple Album', offering an intriguing insight into getting back in touch with Ritchie Blackmore, the idea of the two of them working together again, and MUCH more. It was so good we extended it to three full pages! And we didn't exactly put all of our eggs in one basket, considering we also have Nightwish, Halestorm, Status Quo, Michael Schenker, FM, Black Star Riders, Richie Kotzen, Neal Morse, Jim Peterik, Steve Hackett, Tommy Denander and Nelson... and that's only some of the TWENTY SIX interviews in total. It's a killer line up, with killer tunes attached. You need Fireworks #69, and you can get it via one of the methods listed below! Copies/subscriptions can be ordered direct by emailing [email protected], paying via Paypal. Send £6 (Inc P&P) for UK, £8.95 (inc P&P) for Europe, and £10.95 (inc P&P) for USA/Rest of World. 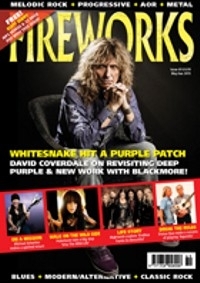 Grab two copies of Fireworks Magazine for FREE from our Download Store!